Sh 2-284 is a group of several HII regions ionised by members of the star cluster Dolidze 25 in the Milky Way's Monoceros arc. This sector provides a window into the Milky Way's Outer Arm region as well as containing an unusual large and cold molecular cloud complex with little visible star formation. The HII region Sh 2-282 (LBN 978) is likely ionised by the O9.5 III pulsating variable giant HD 47432 at a distance of 1500 ± 300 parsecs according to Avedisova. A more recent study finds at least 8 cometary globules in the nebula and gives a distance estimate of 1250 pc. . Either estimate suggests that this star is part of the Mon OB2 association which is discussed in more detail in the commentary on the Fox Fur and Rosette (210° - 200°) sector to the west. Russeil concludes that Sh 2-282 and BFS54 are part of the same star formation region at a distance of 1170 +/ 290 pc. BFS54 is ionised by the B3 star HD 289120  and is also known as the reflection nebula NGC 2282 or VDB 85. Russeil concludes that Sh 2-283, Sh 2-284, Sh 2-285 and Sh 2-286 are all part of the same star formation region at a distance of 7890 ± 290 pc. 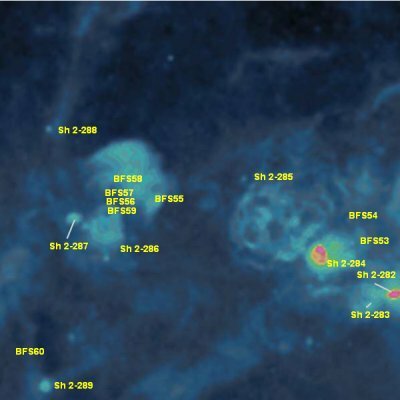 These HII regions thus appear to form a significant arc in the Milky Way's Outer Arm region. There seems to be no name for this arc in the scientific literature. I suggest "the Monoceros arc" as all of these nebulae are located in the constellation Monoceros. 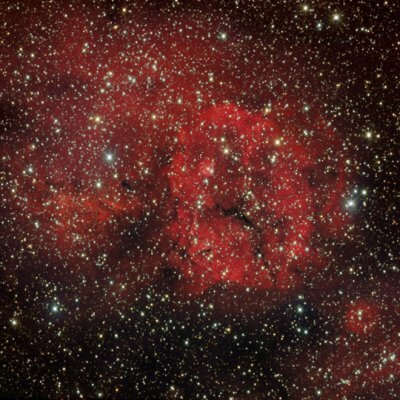 The brightest of these nebulae at radio, hydrogen-alpha and infrared frequencies is Sh 2-284 (LBN 983), which is ionised by the star cluster Dolidze 25. Avedisova gives a lower distance estimate of 5200 ± 800 pc for Sh 2-284. Detailed images of this large object show that it also contains a number of smaller HII regions. This hydrogen-alpha image shows the major nebulae in this sector. Crampton lists 3 ionising stars that may be associated with Sh 2-284: HD 48691 (B0.5 IV), BD +00 1576 (O9 III) and LS VI +00 19 (OB). SIMBAD identifies this last star with Cl* Dolidze 25 MV 1. Reynolds also lists BD +00 1576 as an ionising star for Sh 2-284. Turbide and Moffat add [TM93] SH 2-284 45 (B1:V:) and [TM93] SH 2-284 30 (B1:)  (although these may not really be new stars as they have the same spectral types as Cl* Dolidze 25 MV 15 and Cl* Dolidze 25 MV 17). The only paper focusing exclusively on Dolidze 25 examines the spectra of the stars Cl* Dolidze 25 MV 15, Cl* Dolidze 25 MV 17 and Cl* Dolidze 25 MV 22 and concludes that the cluster is unusually metal-deficient. 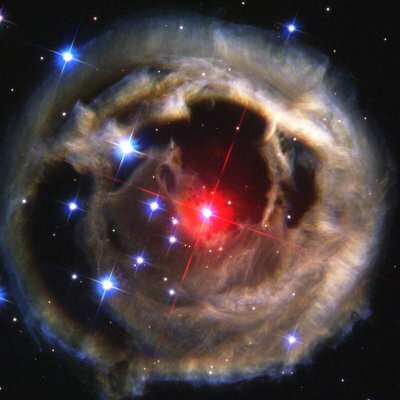 This spectacular Hubble space telescope image shows light from the mysterious V838 Mon nova illuminating dust clouds surrounding the star system. It consists of two main components of similar sizes and CO column densities, which are connected by a tenuous bridge. The northern component harbours its densest core, associated with the bipolar nebula NS14. The faint HII region S287 is associated with the other component. This microwave image shows the major molecular clouds in this sector, dominated by the massive cool Maddalena cloud and the Sh 2-287 molecular complex to its north. This image also shows the ionising stars, clusters and associations in this sector. A group of small nebulae lie in a similar direction to [NS84] 14: BFS55 - BFS59. BFS56 contains the infrared star cluster [IBP2002] CC03. 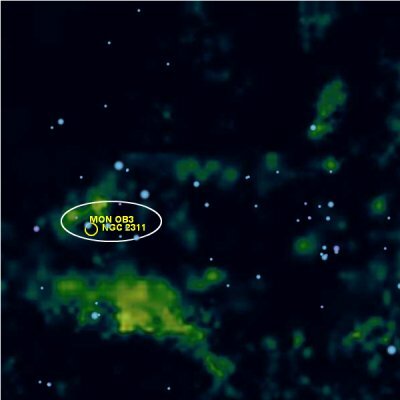 Fich and Blitz find that all of these nebulae with the exception of BFS58 have distances of about 2000 pc, placing them in a similar location to [NS84] 14. Kharchenko identifies an ionising cluster, NGC 2311, that seems to be part of the larger Sh 2-287 molecular complex. She gives one ionising star, TYC 4809-819-2 (B2/3 II), a distance of 2000 parsecs and an age of 398.1 million years. J.A. Graham suggested in 1971 that there are two groups of OB stars in this direction, one at 2400 pc and another possibly at 3800 pc. Subsequent authors (eg. , ) list a new OB association, Mon OB3, in this direction which is not included in Ruprecht's official IAU list of OB associations. 6. ^ Crampton, D. 1971, Astronomical Journal, Observations of stars in H II regions: Spectral classification and UBV photometry. 11. ^ Green, D. A. 2004, Bulletin of the Astronomical Society of India, Galactic supernova remnants: an updated catalogue and some statistics. and here for the most current version of this supernova remnant catalog. 14. ^ May, J., Alvarez, H., & Bronfman, L. 1997, Astronomy and Astrophysics, Physical properties of molecular clouds in the southern outer Galaxy. 34. ^ Humphreys, R. M. 1978, Astrophysical Journal Supplement Series, Studies of luminous stars in nearby galaxies. I. Supergiants and O stars in the Milky Way. and the unpublished catalogs available here.